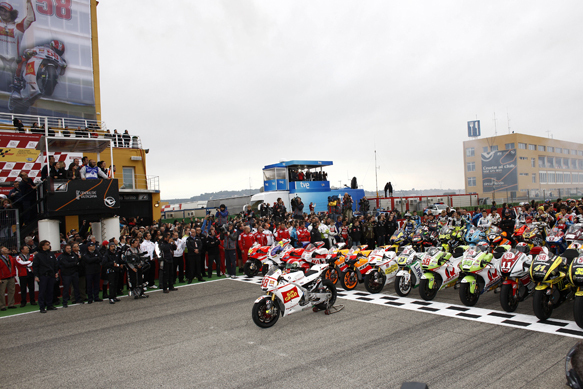 The final round of MotoGP 2011 had been dreaded by most in the paddock. And, arriving at a racetrack in the dark and leaving in the dark made it somehow fundamentally wrong. This is a summer sport. 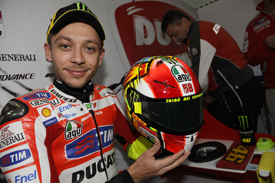 The championship had been decided long ago, indeed in the first couple of races - try as Jorge Lorenzo might to knock Casey Stoner off the top of the standings - but moreover there was the memory of Marco Simoncelli still raw in people's minds. The loss of the fuzzy-haired Italian had hit the paddock hard. This is a collection of individuals who devote their summers and most of their winters to either assisting in, reporting on or promoting bikes going fast. It's a cheesy line, but we're a closely-knit community. I was very upset after Marco's accident. I knew him and had shared possibly the best line of the year with him on stage at Indianapolis during a public Q & A seesion last August. A random question from a lady in the audience asked "What shampoo do you use?" He didn't understand so I had to explain it to him again, only for him to soon twig what was going on: "Heyyyy, eye dunno; my Mama buy it for me." Cue proper belly laughter that Friday evening at Indy. In the maelstrom of thoughts after his death, that was the one thing I'd forgotten about when writing my memories of Marco on the evening of his terrible accident. So I desperately asked around the photographers in the paddock whom I knew were there to see if anyone had captured it. The result was a simple picture in among the gigabytes of Jules Cisek: Marco's mirrored glasses and some guy in a white shirt being reflected in them. Lump in throat time again, but what was wrong with me? I've had to deal with people getting killed before and I'll unfortunately have to deal with it again. So I sought a solution in totally forgetting about motorsport until it was time to prep for Valencia. To MotoGP's great credit, the final race turned out not to be a melancholy weekend, but more of a celebration of what was good about Simoncelli. Come Friday Valentino Rossi was laughing about a great memory he held of Marco from Le Mans this year when the entire MotoGP field seemed to be slagging the guy off for his wild riding. 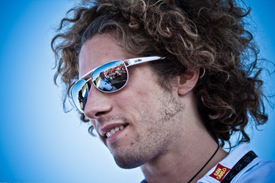 "In the riders' safety commission there was again a lot of talking about Marco and his riding," Rossi recalled. "But late just before we went to sleep that night we saw each other on scooters in the paddock. I said, 'Marco, with all this stuff going on, you must take it carefully tomorrow and stay out of trouble.' 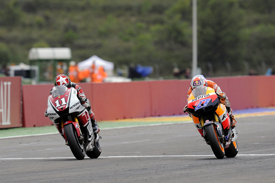 Then the next day he and Pedrosa hit each other!" Rossi was laughing all the way through his story, and cued much laughter from the assembled throng too. Many people had T-Shirts or badges or stickers but a far more private tribute was in the commentary box of northern Italian radio station Radiotelevisione Svizzera Italiana (RSI). 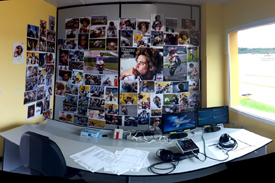 The box was covered in Simoncelli pictures, and even flowers, by commentator Alessandro Tamburini. "He used to come into the box and help me during the commentary of some MotoGP races when he was in 250," said Tamburini. "He was a super nice guy, but he's here with us in the box for this last time. Next race I'll cover the place with pictures of girls. Far better, eh?" Again, we laughed. Come Sunday it was the usual routine of warm-up and races except for the tribute lap with every single bike in the pitlane to celebrate Simoncelli. Kevin Schwantz led the parade on Marco's Gresini Honda #58, but again Rossi smiled as he donned a #58 T-Shirt and held high a #58 flag and set off on his Ducati. He had a cheeky grin and it wasn't just for show. Valentino's more honest than that. The clip on TV at the end of the tribute lap and massive firework display put a lump in a few people's throats, least of all mine, but a few minutes later we were racing. Just like in South Africa in 2003, the race after Daijiro Kato's death, the team that had lost its rider had a victory - this time a maiden victory too with Michele Pirro dominating the Moto2 race. There was justice in that. The MotoGP race featured a big crash at the first corner as Andrea Dovizioso squeezed Alvaro Bautista into Rossi, Nicky Hayden and Randy de Puniet. Amazingly the worst injury was a fractured wrist for Hayden. Just as things were looking good for a cracking final race, four guys with more than a chance of the podium - for this was an afternoon in the rain where any one of them could have pounced - were out. Once I'd seen they were okay, I was really annoyed for the race prospects as Stoner just disappeared into the distance. It now wasn't a race, it was a rout. But then it rained a bit more and Stoner's 10s lead collapsed to nothing. Then Ben Spies passed him in to the lead with two and a half laps to go! Stoner hung it out on the last half a lap like he'd not had to do all season. This was risk-taking at its best, and it worked. The Aussie threaded the RC212V for the last time out of the final corner over an extra grippy strip of tarmac. There seemed no way a bike could close down on Spies from that far back, but the Honda Motor Company's special product somehow managed it. Stoner won by half a wheel, or 0.015s. It was, ironically, the closest 800cc finish after five years of the formula and it sets up the return to the properly-sized 1000cc engined bikes for next year and beyond. As one very senior paddock figure who has influence at a high level said at the weekend, "These stupid 800s were rules pushed in by Honda after Kato's accident. They were wrong and with hindsight a mistake. Good riddance to the things." The 1000s are testing for 2012 as I write this, and everyone has a spring in their step thinking about next year's new dawn of the madness that is prototype motorcycle racing. MotoGP is back on track, emerging from under the pall that was cast over the paddock just days ago. There are an awful lot of people looking forward to going racing again on April 15 2012.